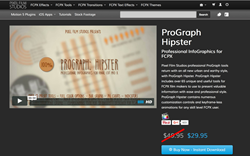 Pixel Film Studios announced the release of ProGraph Hipster for Final Cut Pro X. This is a great new ProGraph with an original style. Pixel Film Studios professional ProGraph tools return with an all new urban and earthy style, with ProGraph Hipster. ProGraph Hipster includes over 65 unique and useful tools for FCPX film makers to use to present valuable information with ease and professional style. ProGraph Hipster contains numerous customization controls and keyframe-less animations for any skill level FCPX user. ProGraph Hipster includes numerous useful tools for film makers to use within Final Cut Pro X. ProGraph Hipster includes Bar Graphs, Pie Charts, Indicator Charts, Text graphical elements, and much more. Each preset also contains drop shadow settings and wiggle animation controls for added style. ProGraph Hipster contains all the easy-to-use on-screen controls that make them a standard for professionals. with the on-screen controls, users can move and arrange each element in real-time, and customize each layout to how they desire, within just a few seconds. ProGraph Hipster includes different styles of Bar Graphs, Number Charts, and Pie Charts that allow the users to even insert media, for more visually appealing presentation elements. Full Color controls, drop shadow options, and paper overlays, allow these presets to go to the next level stylistically. ProGraph Hipster contains over 65 Final Cut Pro X Generator tools designed for users to display important information with a unique style. ProGraph Hipster also includes a compounding tool, which can be used to manipulate each graph in 3d space individually, or as a group. Designed for Final Cut Pro X.